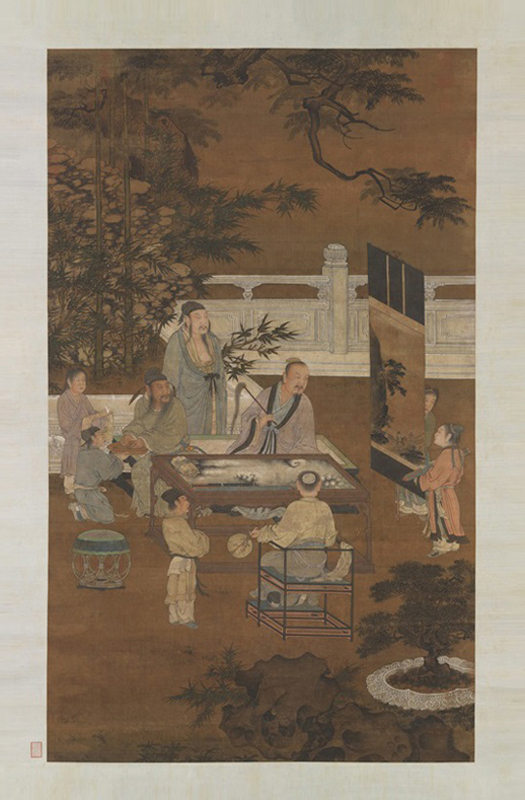 The four arts (四藝, siyi), or the four arts of the Chinese scholar, were the four main academic and artistic accomplishments required of the ancient Chinese scholar-gentlemen. They are qin (琴, a seven-string instrument), qi (棋, the strategy game of Go), shu (書, Chinese calligraphy) and hua (畫, Chinese painting). Endowed with cosmological and metaphysical significance and empowered to communicate the deepest feelings, the qin (Chinese zither), beloved of sages and of Confucius, is the most prestigious instrument in China. Han dynasty writers state that the qin helped to cultivate character, understand morality, supplicate gods and demons, enhance life, and enrich learning. 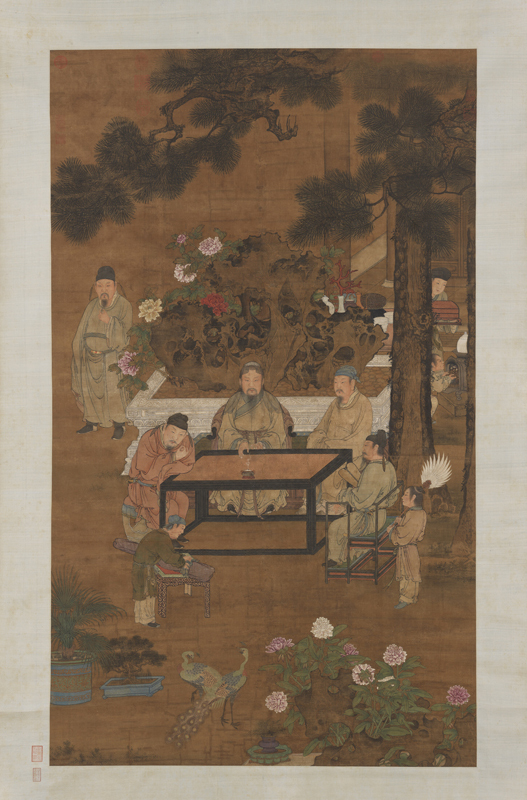 Ming dynasty (1368–1644) literati who claimed the right to play the qin suggested that it be played outdoors in a mountain setting, a garden or a small pavilion or near an old pine tree (symbol of longevity) while burning incense perfumed the air. A serene moonlit night was considered an appropriate time for performance. Each part of the instrument is identified by an anthropomorphic or zoomorphic name and cosmology is ever present: for example, the upper board symbolizes heaven, the bottom board symbolizes earth. According to legend, in the Spring and Autumn Period (ca. 770–476 BC) there was a qin player Bo Ya (伯牙). One day his performance in the open air was overheard by the wood-chopper Zhong Ziqi (鐘子期). Zhong Ziqi immediately understood that Bo Ya was describing lofty mountains and running water through his music. Amazed to have found someone who understood his music, Bo Ya developed close friendship with Zhong Ziqi. Later when Zhong Ziqi died, Bo Ya was in deep grief that he broke the strings and threw the qin on the ground. Ever since then he never played again. Until today people in China still use the expression “zhiyin” (知音, literally, understanding the sound) to refer to close friends, and the phrase “High Mountain and Running River (高山流水)” to mean close friendship or wonderful music. 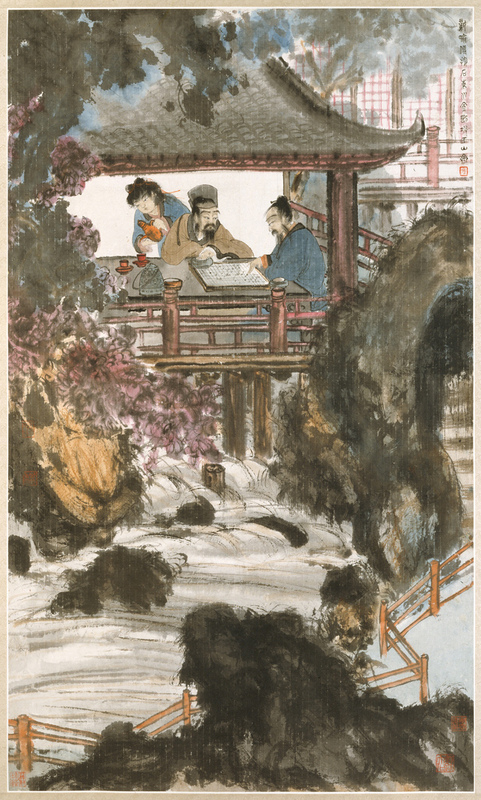 In Chinese scholar paintings, one common theme is “bringing the qin to visit a friend (攜琴訪友)”. The qin is symbolic of cultural accomplishment, as well as mutual recognition between like-minded individuals. Qin of Prince Lu. Ming Dynasty. Metropolitan Museum of Art, New York. 2. Zhao Ji (Attributed). Listening to the Qin. Palace Museum, Beijing. 3. Ma Yuan. On a Mountain Path in Spring. National Palace Museum, Taipei. 4. Tang Yin. Scholar Playing the Qin. National Palace Museum, Taipei. 5. Shangrui. Bringing the Qin to Visit a Friend. Lvshun Museum, Dalian. Qi is a board game which is now called weiqi (圍棋) in Chinese (go in Japan and the West), literally meaning “surrounding game”. 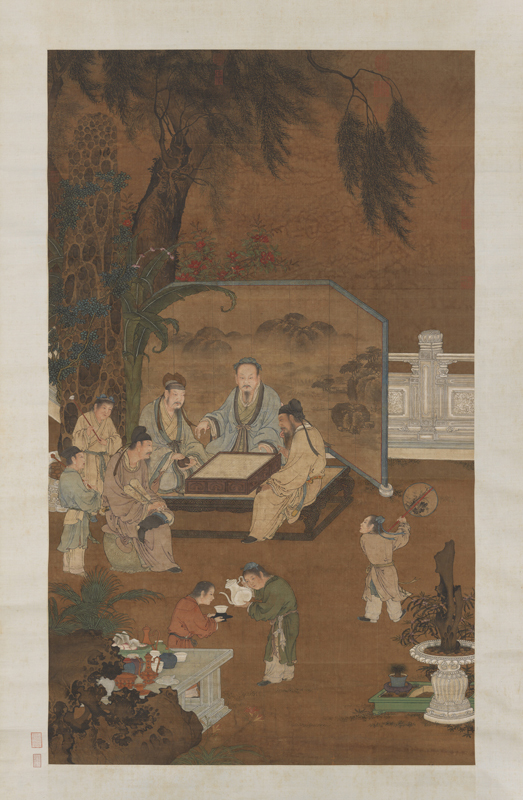 Many theories exist regarding the origin of weiqi in Chinese history. It may have been an ancient fortune-telling device used by Chinese cosmologists to simulate the universe’s relationship to an individual. Another story suggests that the legendary Emperor Yao invented it to enlighten his son. 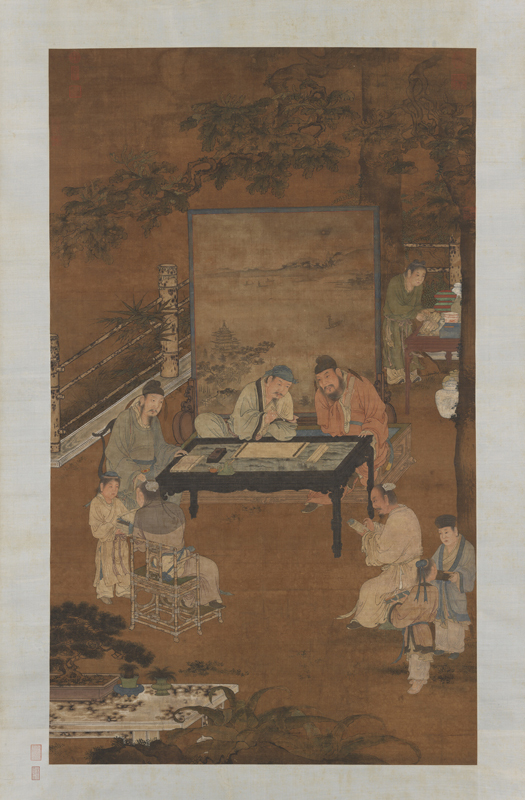 Certainly weiqi had begun to take hold around the 6th century BC when Confucius mentioned it in his Analects. Weiqi is a game in which two players take turns placing black and white stones on a board consisting of a grid of 19 by 19 lines. Stones are placed on the intersections of the grid. Once placed on the board, stones may not be moved, but stones may be removed if a stone or group of stones is surrounded on four sides by stones of the opposing color occupying all orthogonally-adjacent points. The two players place stones alternately until they reach a point at which neither player wishes to make another move. At the conclusion of the game, it is scored by counting the territory occupied or encircled by each side to determine the winner. 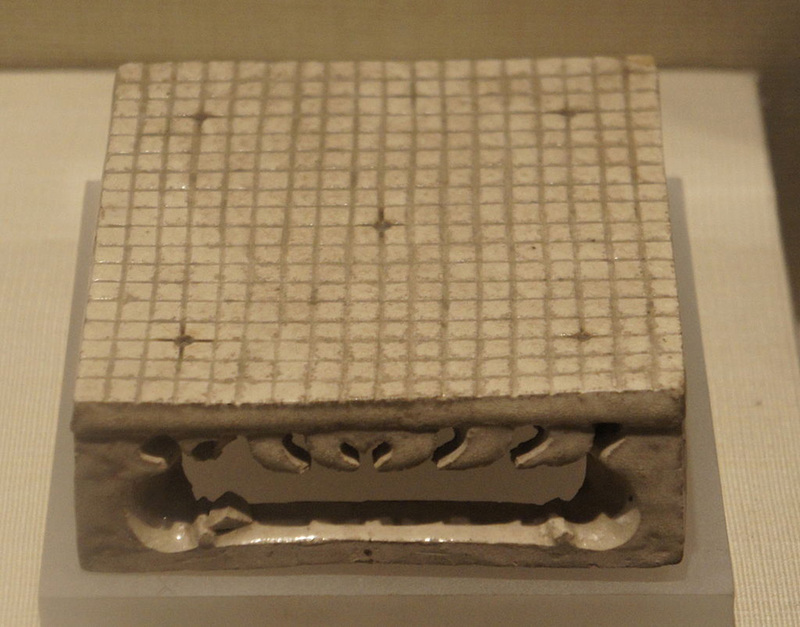 Weiqi board model with 19 by 19 lines from AD 595, excavated in 1959 from the tomb of Zhang Sheng in Anyang, Henan. Henan Museum, Zhengzhou. 2. Zhou Wenju. Playing Weiqi under Double Screens. Palace Museum, Beijing. 3. Xie Shichen. Four Elders. National Palace Museum, Taipei. 4. Fu Baoshi. Playing Weiqi at a Waterside Pavilion. Metropolitan Museum of Art, New York.